On a hot summer’s day cold ceviche is the perfect lunch or afternoon snack. It’s light, healthy, high-protein and low fat. It’s popular in Mexico, Ecador, Peru and other Latin America countries where white fish, chilies and citrus are a daily part of their diet. It’s the juice of the lime – or lemon – that “cooks” the fish during the marinating process. You can pretty much use any kind of white fish – mahi mahi, cod, halibut, tilapia. For this recipe, I use cod, as I like the firmness and taste of this fish. Serrano chilies and mango balance out the citrus with some heat and sweetness. Corn and red bell pepper add some texture to this dish that is great eaten as is or on a bed of lettuce or with tortilla chips – baked of course. 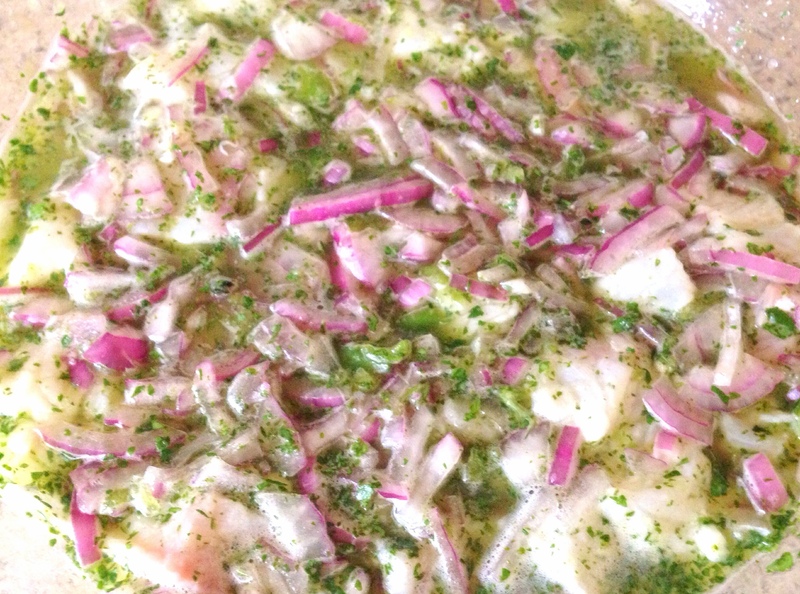 Make the Leche de Tigre, which is the Peruvian term for ceviche marinade. This recipe calls for the juice of eight limes, garlic cloves, cilantro, and Serrano chili peppers seeded, pureed together in a blender, then poured over the fish pieces. Red onion is added to the mixture then covered with plastic wrap and refrigerated for three and a half hours. About halfway into “cooking,” add the corn and red bell pepper to the fish and turn the fish in to bowl as you mix it all through and refrigerate for the remaining hour and a half. When ready to serve, dice the mango and add to the fish and serve. This recipe is not that spicy. If you want extra spice, when you add the mango, add a sliced Serrano chili pepper to the mix as well. Add the first five ingredients to a blender and puree to make the Leche de Tigre. Add fish to a glass bowl and pour the Leche de Tigre over it. Marinade should cover fish. Add the red onion and mix through. Cover fish with plastic wrap directly on the fish. Refrigerate for three and a half hours. After the first hour and a half, add the cooked corn and red pepper. Mix through turning the fish in the marinade. Apply a new sheet of plastic wrap directly on the fish and refrigerate for another hour and a half. When you are ready to serve, dice the mango and add it to the ceviche and serve. If you want extra spice, when you add the mango, add a sliced Serrano chili pepper with the mango. 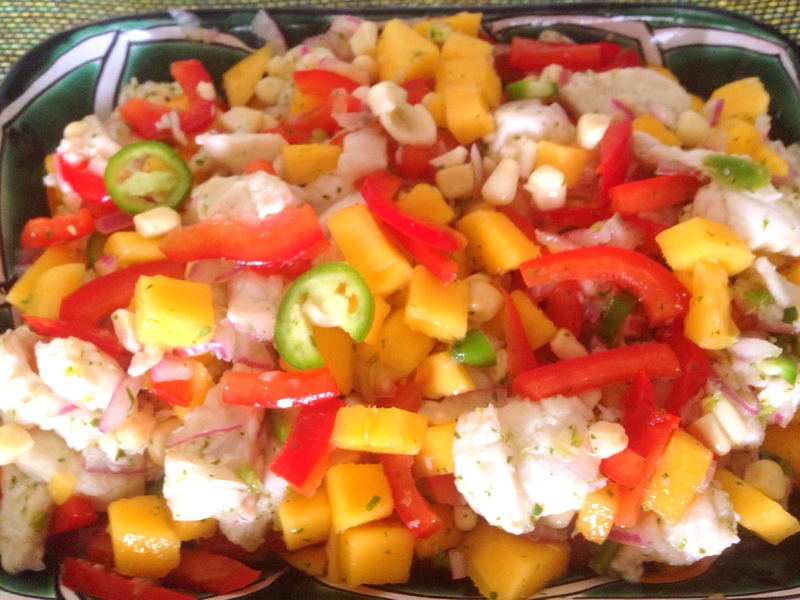 This entry was posted in Blog, Recipes and tagged ceviche with mango, Leche de Tigre, Serrano chili on May 30, 2014 by Leslie.